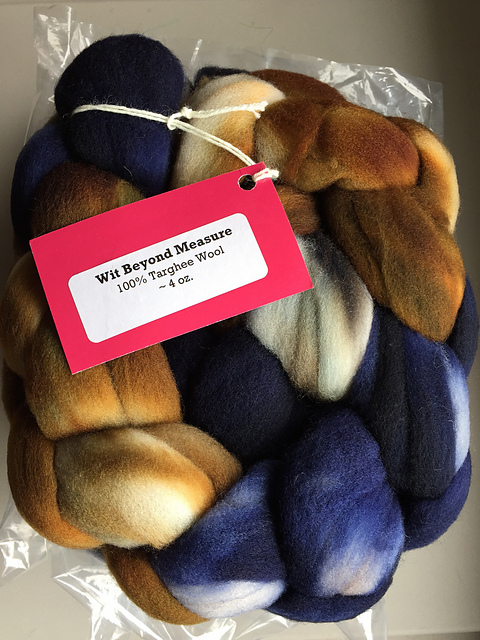 I loved Dyeabolical‘s Wit Beyond Measure colorway so much that I ordered it as soon as it was available. My 8oz of Targhee spent a little time in my stash as I waited to figure out exactly what I wanted to do with it. When I got wind that the Akerworks folks were hoping for someone to try out a 4-ply yarn using plying bobbins in the “AkerKate” test I knew I’d found the match for this fiber. It was a really pretty and really fun spin. There was a bit of a delay as I waited for my Akerworks SuperJumbo Lendrum bobbins to arrive. Since they became available I’ve wanted to add them to my tool kit for traveling and knowing they’d be useful in the test gave me the incentive to pick up a couple. Upon finishing the singles, I could tell early on that I’d not quite measured one of the quarters of fiber very accurately — either I mis-weighed or I mis-spun a little as one bobbin was clearly more full than the other. No bother, I had a plan. I went into my first 4-ply with gusto. It turned out SO PRETTY. 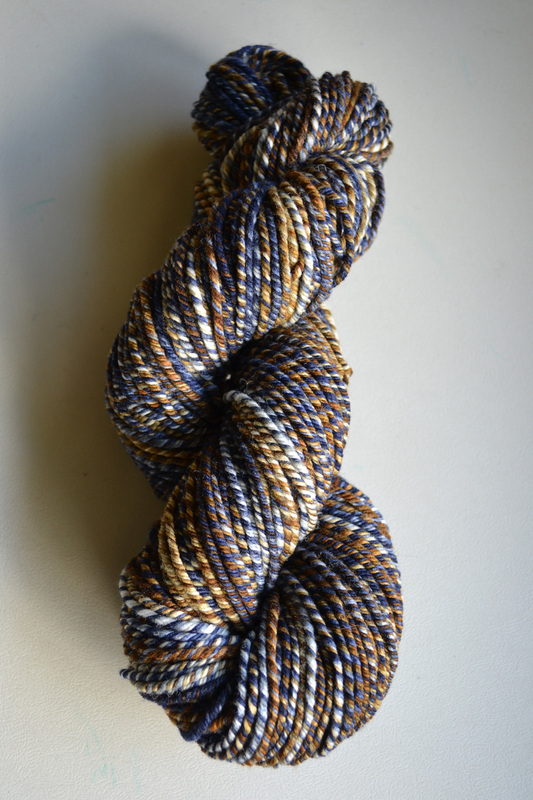 This skein far exceeded my hopes. I’m showing you this picture so that you can see that even though this is washed and set it’s still got a little extra energy & twist in it. For the next 4-ply, I’ll definitely want to tame that just a bit. But I’m not too worried — I can tell it’ll knit up just fine. It finished with about 150yards of heavy aran/light chunky yarn and in my eyes it’s really something special. I had 3 bobbins with yarn on them once I ran out of yarn on the 4th. One bobbin had loads — as I mentioned before I knew would be the case — and the other two not so much, but enough to not want to waste. I started in on a 2-ply using the loaded bobbin and one of the lighter bobbins, joining the second light bobbin when the first ran dry. When the 2nd light bobbin ran out before the heavy one was finished (I’m telling you I was WAY off with that one), I made an Andean plying bracelet and used up every last bit of my 8oz of Wit Beyond Measure leaving me with a fun little sport/DK weight 70yard skein. 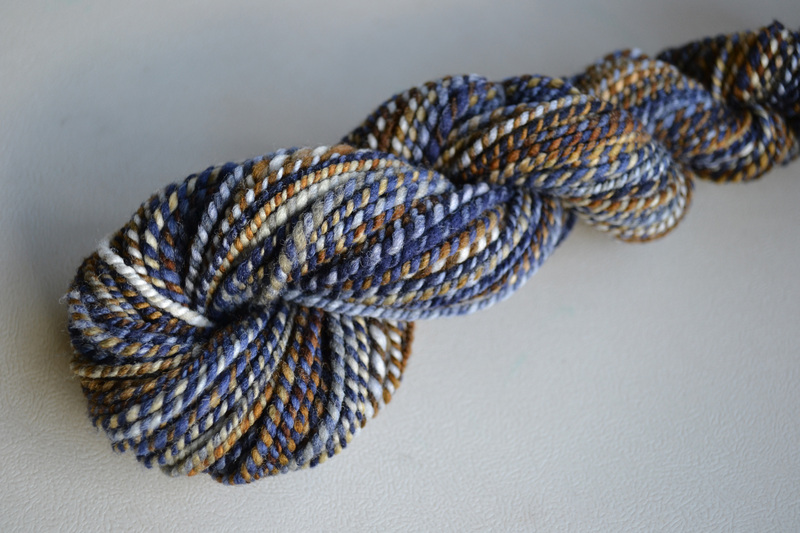 It was fun to see how this colorway looked in a 2-ply versus 4-ply. They have such different personality and to an extent different characteristics because of how they were plied. One thing’s for sure, it was a fun little experiment with my new SuperJumbo Akerworks bobbins, the Akerworks Flat Pack Lazy Kate — which handled the 4-ply like a champ — as well as seeing the yarn spin up in two different ways. I surely will be enjoying more of these types of spins in the near future — of this I have no doubt! It’s like that colorway was meant to be a 4 ply! 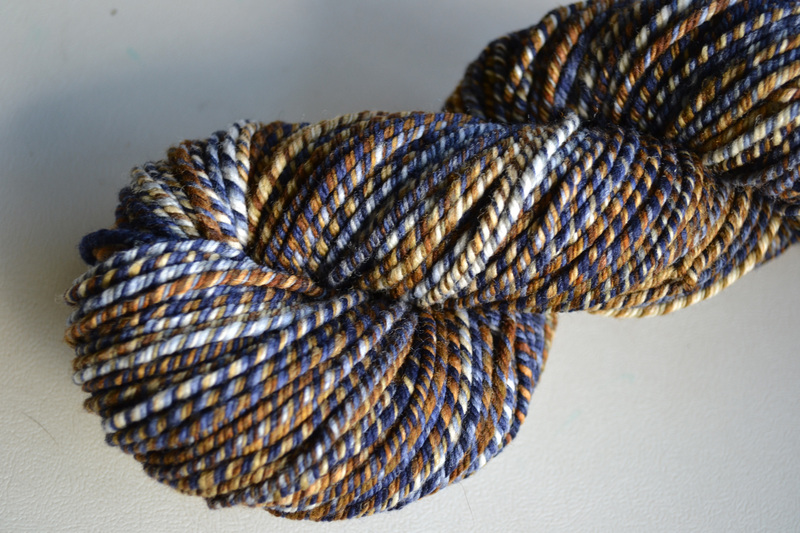 It’s gorgeous as a 2 ply as well, but it really shines as a 4 ply! I have to agree! I’m so happy I was compelled to go the 4-ply direction with it! STUNNING! Beautiful spinning, and I agree with shellssells, it really shines as a 4 ply. I think so, too. I’m so lucky I was working on testing the Akerworks Kate or I never would have thought of it! Seeing both versions is really mind blowing. 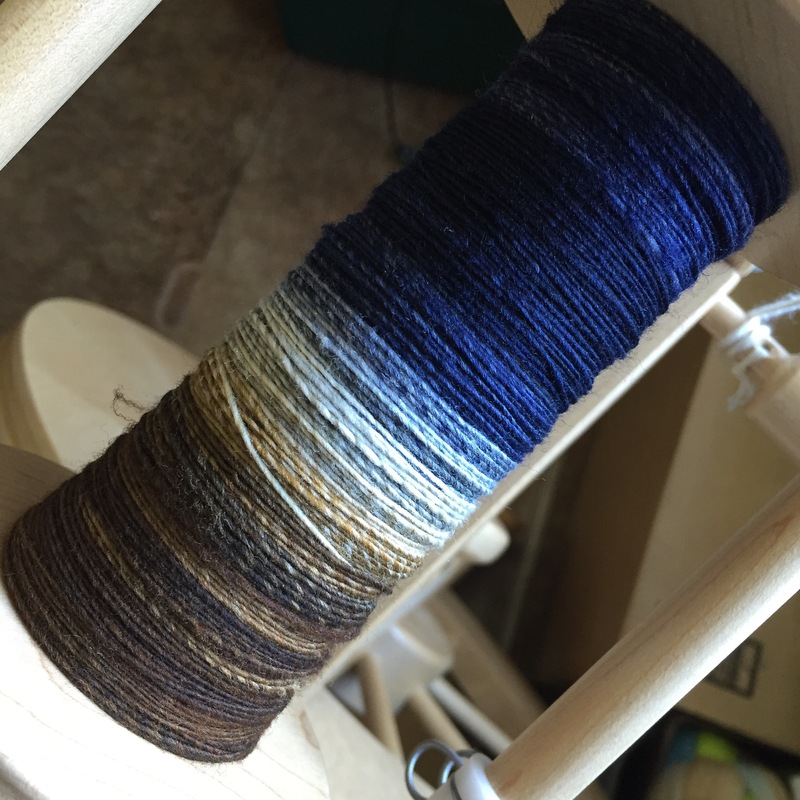 I tend to spin my hand-dyed fiber as 2-plies because I am usually trying to maximize length, but this has got me thinking new thoughts. I hear you! I’m all for the big yardage, but sometimes I like to mix it up. 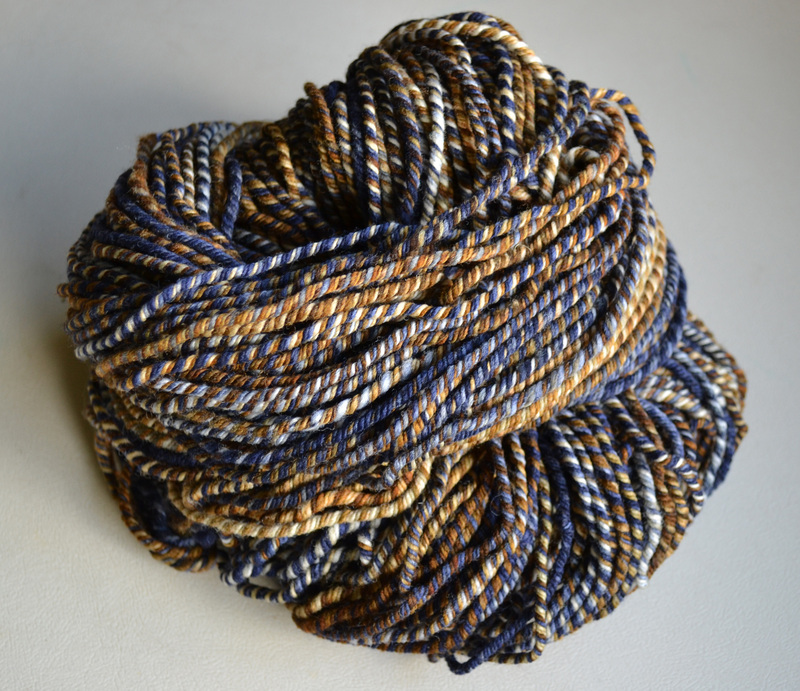 There are so many very cool ways to create yarn — best we try them all!